2014 Honda CR-V MID-SIZE CROSSOVER, FUEL EFFICIENT !! Trim:MID-SIZE CROSSOVER, FUEL EFFICIENT !! 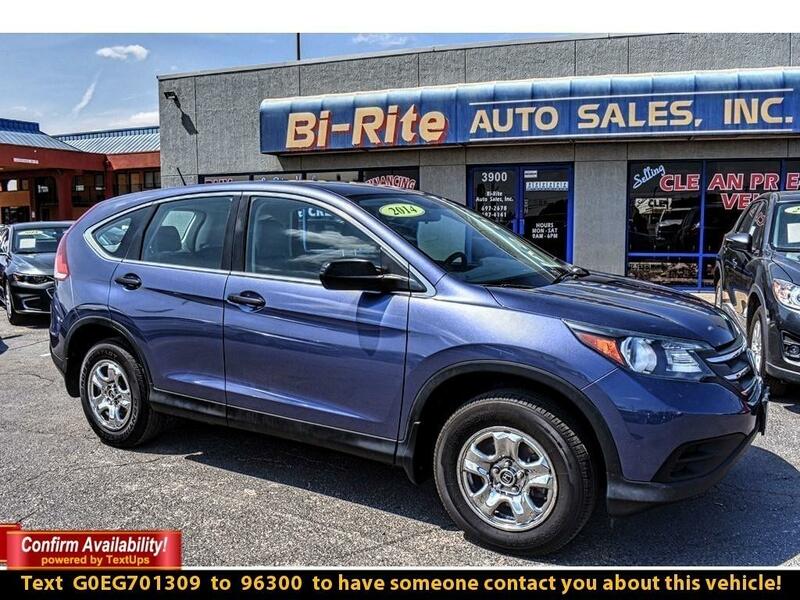 Add some versatility and style to your day with our 2014 Honda CR-V LX SUV shown in spectacular Twilight Blue Metallic! Powered by a 2.4 Liter 4 Cylinder that generates 185hp with its smooth-shifting 5 Speed Automatic transmission for easy passing power. Blending sport and comfort with thoughtful touches inside and out, this Front Wheel Drive SUV is capable of handling all your needs and rewards you with near 30mpg on the highway. Take some time to examine our photos of this LX and imagine yourself behind the wheel! The distinct grille and sleek stance inspire confidence at every turn. Inside our LX, a central display serves as your personal command center to give you a customized driving experience and power is literally at your fingertips with illuminated steering wheel-mounted controls. You'll appreciate Bluetooth, power locks/windows, supportive seating, and plenty of cupholders. Of course, with massive cargo space and 60/40 split rear seats, this CR-V can handle your family and everything they need for their many adventures! Masterfully built with advanced capability engineering by Honda, vehicle stability assist with traction control, excellent outward visibility, a backup camera, and an army of airbags, the CR-V is unparalleled in safety. Reliable, comfortable, and safe - it can do it all! Get behind the wheel and begin your newest adventure today! Print this page and call us Now... We Know You Will Enjoy Your Test Drive Towards Ownership! Please call us for more information. Vehicle Inquiry for 2014 Honda CR-V MID-SIZE CROSSOVER, FUEL EFFICIENT !! Trim: MID-SIZE CROSSOVER, FUEL EFFICIENT ! !